The results were published on 26 April in the leading physics journal Physical Review B. The efficiency of solar cells depends on trapping and absorbing light and can be increased by using a back reflector: a mirror behind the solar cell material that reflects light that was not absorbed and leads it back into the solar cell. The ideal mirror reflects light incident from any angle, known as omnidirectional reflectance, and for all frequencies (or colors) of light. 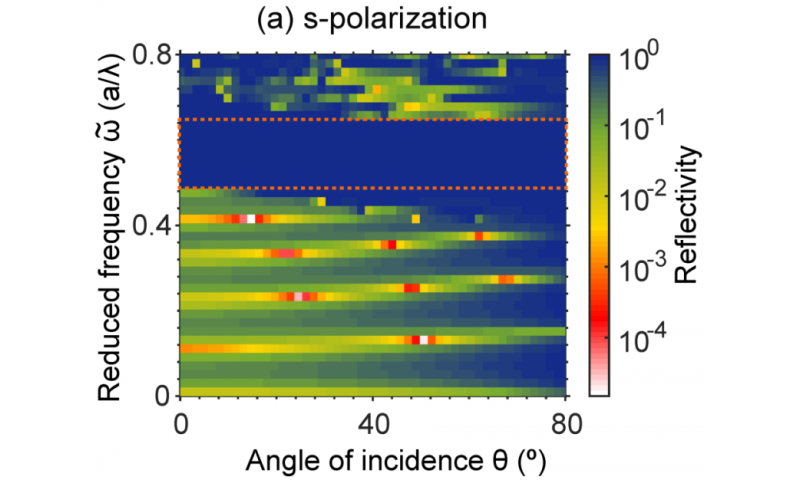 Such omnidirectional reflectance for dielectric structures is associated with three-dimensional photonic crystal nanostructures that sustain a so-called complete photonic band gap. However, researchers always thought such structures would have a narrow frequency range of operation and their omnidirectional behavior has never been demonstrated to date. An interdisciplinary team of physicists and mathematicians from the University of Twente has now performed advanced calculations on a very promising material developed in the Complex Photonic Systems group. "We studied so-called inverse woodpile photonic crystals", says PhD student Devashish. "These crystals consist of regularly ordered array of pores drilled in two perpendicular directions in a wafer of dielectric such as silicon. The crystal structure is inspired by diamond gemstones." The researchers studied the reflectivity of the cubic diamond-like inverse woodpile crystals by numerical calculations and interpreted recent experiments. They employed the finite element method to study these crystals surrounded by free space. "We found that even very thin inverse woodpiles strongly reflect many colors of light omnidirectionally", Devashish says. "In inverse woodpiles, the absorption of light is negligible. This makes them a great candidate as a back reflector in solar cells. 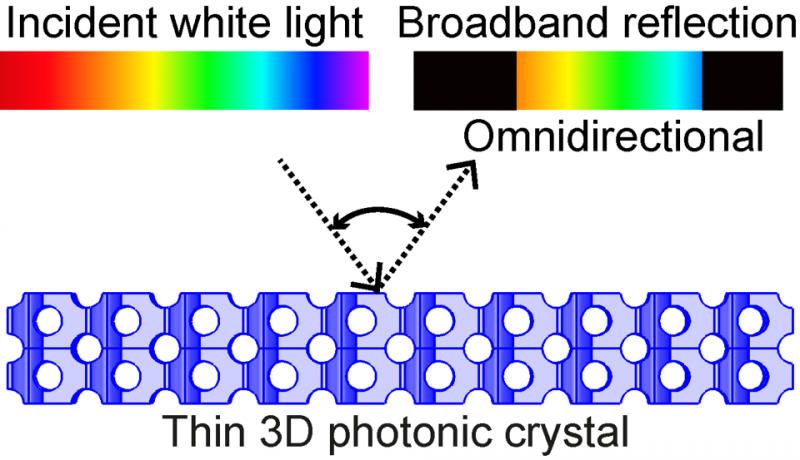 We also expect these diamond-like photonic crystals may lead to on-chip lasers, invisibility cloaks and devices to confine light in extremely small volumes."